At Mt. 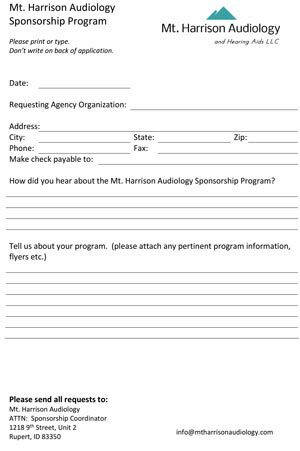 Harrison Audiology, we are committed to providing exceptional hearing care to everyone who needs it. We’re truly grateful to be the premier source for audiology services in the Magic Valley area and we believe giving back is the best way to show our appreciation to our valued community. In addition to our regular contributions to the Boys and Girls Club of Magic Valley, the Declo and Minidoka High School Athletics and Band activities, and the VA Choice Program, we are always looking for new ways to serve. We are grateful for the opportunity to serve our community!